In the ballistics page I explained what a MOA is (1/60th of 1° remember?). 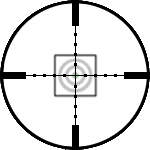 Another unit of measure used in sniping is the mil. What is a mil? The complete name is "angular mil" (Wikipedia). Like the MOA, it measures angles. A full circle is divided in 6400 mils. So 1 mil is equal to 1/6400 of a circle. Note: Russians use 1/6000. Read Wikipedia for details. One (1) mil roughly equals 3.5 inches at 100 yards. See the Exact Sizes page for exact values. 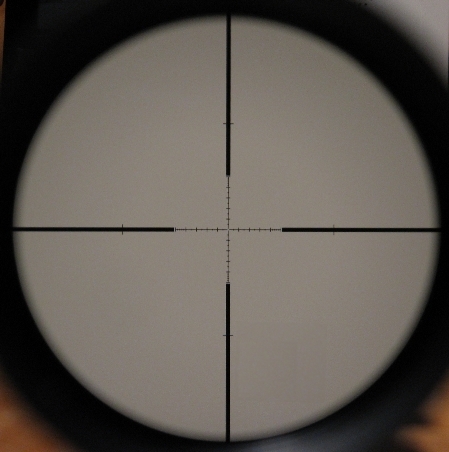 Most scope manufacturers now offer scopes with mildots. On the reticule, small dots are added at every 1 mil of distance. The dot is NOT 1 mil in size! 1 mil is the distance between the centers of each dot. 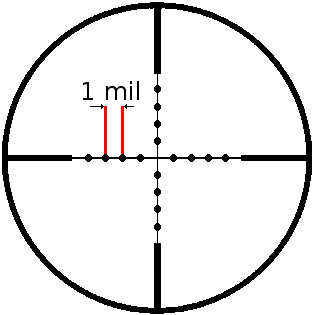 In order to help estimate mil sizes, some manufacturers also produce reticules with 1/2 mil marks. Leupold even has 0.2 mil marks (in the TMR reticule). 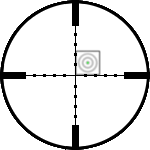 You can purchase rifle scopes, binoculars and spotting scopes with mildots reticules. The standard issue Canadian army compass is also in mil, not degrees. At 1000 yards, 1 mil is 1 yard (or 3 feet, or 36 inches). So if you know the size of the target and measure its size using your mildot scope, you can calculate the range to that target. For exact sizes, see the Exact Sizes page. You can learn to use mildots with the Shooter Ready simulation software. It is very well done.